Optelec is the world's largest specialist in electronic equipment for the blind and partially sighted. Click here to access the Optelec international web site. The Latest Innovation in Video Magnification Technology. 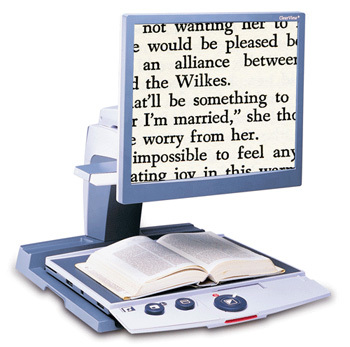 ClearView+ Video Magnifier System magnifies anything placed under it from 2 to over 50 times its original size, always maintaining perfect focus. It also features a specially designed high quality monitor and lighting design, for optimal visual enhancement. Best of all, the entire system can be controlled with a single button, and customized to meet your exact needs. The Compact+ is the perfect combination of sophisticated design and functionality. Take the Optelec Compact+ on the go to read price labels, maps, bus schedules, directions and your favorite restaurant menus. 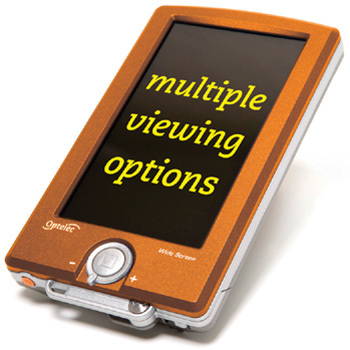 The Compact+ has a 4.3" color TFT screen, with Full Color, Black and White, Blue and Yellow, Black and Yellow and Reverse Mode and up to 10x magnification.